Tourmaline, while little known to the general public, is widely considered by gemologists to be the most colorful and diverse gem family. This is in one part due to the wide variety of colors the gem can come in: from red to blue, from green to black, and all shades in between. But tourmaline is also known for its dichroism- a phenomenon in which each gem actually contains two shades of the same color, observed by viewing the gem at different angles. This diversity of color and tone makes tourmaline very popular with fashion designers, and its 7.5 hardness makes it even more popular for use in jewelry. The blue variety of tourmaline is widely considered to be the rarest. The name is derived from the word “indigo” (in fact some spell it indigolite) due to the inky-blue color of some of these gems. The rarest shade is a medium dark blue with a hint of violet, while the most commonly encountered shade of indicolite is dark greenish blue. There is actually a debate as to whether or not teal tourmalines are indicolite: in our opinion an indicolite needs to be primarily blue, so the predominately green or teal tourmalines are actually verdelite, but there is a lot of grey area here. The classic mines for indicolite are in the Minas Gerais region of Brazil where they have been mined since the late 1700s but these deposits are producing very little material. While there is never a steady supply of indicolite on the market, we do see a few exceptional examples coming from Namibia where they were discovered in the 1990s. The occasional gem is also found in California, Maine, Mozambique and Afghanistan. We tend to sell indicolite in 1-2ct sizes the most because the larger stones can be overly dark, and large gem quality stones that are not dark are simply unheard-of. Indicolite can have many variations in tone and saturation so we tend to set indicolite in whichever way is most advantageous to its particular shade of blue; for example indicolite set in white gold can be a great alternative to the slightly greenish blue Australian and Thai sapphires that are so popular today. 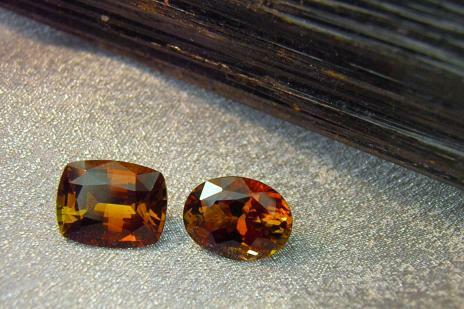 In the above photo, the gem at left is Brazilian, the central two are Nigerian, and the darker stone at right is Namibian. They all weigh between 1.5 and 3.25cts. 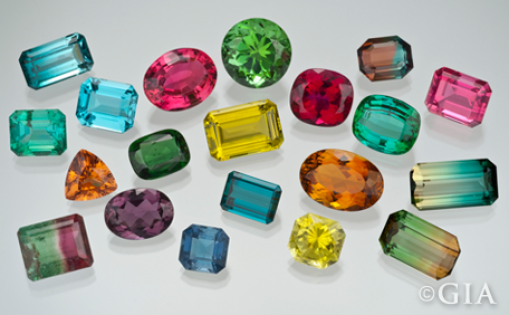 Cuprian tourmalines are by far the most prized and valued of all tourmalines. 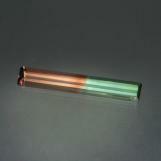 The word “cuprian” refers to the fact that these gems are colored by trace amounts of copper in the crystal structure. They were first discovered in Paraiba Brazil (hence the name) in the late 1980s and shocked the gem world with their amazing color. After only one year on the market the supply did not meet the demand and prices started to escalate until the mines were exhausted only a few years later. These gems are prized for their intense color: true blues and purples, bright emerald green, and the rare neon “windex” blue that can even glow in the dark! The photo at left shows the colors that came from the original São José da Batalha mine in Paraiba Brazil, photo courtesy of the Gemological Institute of America. Even though we can no longer get the Brazilian Paraiba tourmalines the gem world was blessed with recent finds of cuprian and seafoam tourmalines in Africa and Afghanistan. 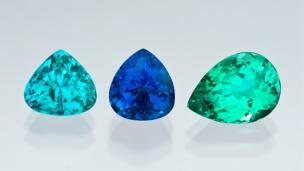 The Afghan stones tend to be an extremely bright medium to light bluish green and are available in larger sizes at affordable prices, due to the fact that they contain less or even no copper (the middle three gems in the below photo, weighing from .90-2.90cts). The African stones, mostly from Mozambique or Nigeria, are usually light blue- like the original Paraiba deposits, but they tend to have more inclusions so we only carry them when we find a gorgeous example at a competitive price (like the stone below, far right). Rubellite is another rare tourmaline variety named for its resemblance to a fine ruby. Accordingly most gemologists say that for a tourmaline to be a “rubellite” the color has to be medium to dark and quite saturated with red, meaning pink or purple tourmalines are classified separately. The two main sources for fine rubellite are Nigeria (since the 1990s) and Brazil (since the 1800s). The color range is truly shocking- a deep intense red, raspberry, intense pink with red undertones, and every nuance in between. Our favorite stones would have to be the Nigerian simply because they are freer of inclusions, closer to a pure red, and more available now. In fact, one of our vendors bought a piece of Nigerian rough that was so big that this one piece of rough cut over 1,000 gems that weighed from .5-10cts! The princess cut and trillion cut gems in the below photo are from this Nigerian deposit, the cushion at left is Brazilian. Some rubellites display a color that is best described as “cranberry:” a slightly less intense red with strong purple undertones. This color is a favorite among Chinese buyers so we have seen a sharp increase in price for these gems, especially for stones over 5cts. We recommend rubellite for anyone who wants the look of a fine ruby but in larger sizes, but some shades of rubellite are totally unique to the species and represent an excellent value in the gem world. Pink tourmaline is ideal for the client looking for a pink gem in a larger size. From pastel baby pink, to hot pink, to rose and magenta, there is an infinite variety of shades and tones of pink available in tourmaline. Most pink tourmaline we sell today comes from East Africa (Mozambique and Nigeria) and Brazil. The Brazilian stones tend to be larger and darker but also more included, while the African stones come in every shade known and are generally cleaner. Some of the best pink tourmalines we carry come from California, specifically the Pala and Stewart mines. These localities were discovered almost 100 years ago and have produced a steady trickle of exceptional bubblegum, pink tourmalines which are a totally pure pink. These gems are really cool when they are faceted by American lapidaries because then the stone is mined, cut, and set into jewelry in the USA. As a rule 5ct pink tourmalines are not uncommon, so we are able to find large examples with fine color for reasonable prices which is great for the client looking to make a custom piece. In the above photos the left two gems are purplish pink gems from Mozambique, the center hot pink gem is a Californian stone cut by John Dyer, and the two gems at right are from unkown African sources. The stones weigh on average 3.5cts. Green is the best known color of tourmaline, but we can assure you that a good green tourmaline is not easy to find. Green tourmalines have become one of our best-selling gems due to the variety they come in and their affordable price point. We sell gorgeous forest and olive green tourmalines 1-3cts in size in the low hundreds of dollars, and the mint and teal shades are only a little bit more. The top green tourmaline discoveries of late are the Afghan mines. The key difference that distinguished the Afghan tourmalines is a higher degree of transparency, coupled with lighter tones, which make these very bright and lively once set in jewelry. There are also some classic American green tourmaline deposits, the most famous being the mines in Newry, Maine and the Pala and Stewart mines in California produce green tourmaline too. Our key source for larger green tourmaline is Brazil, but we are watching new tourmaline discoveries in Tanzania and Madagascar that are producing some amazing gems to see if they will be able to compete with our other sources. The above right two gems are Afghani, the central 9ct stone is Brazilian, and the left two are from African sources. the bicolor and watermelon tourmaline we see today is from Brazil and Nigeria, not California. The exceptional stone at left, photo courtesy of John Dyer, shows a perfect 50/50 color split, and was cut in an elongated shape that mimics the crystal structure of these gems. Chrome tourmaline is the rarest variety of green tourmaline and it owes its pure green color to traces of the element chromium. These are commonly confused with top gem quality tsavorite garnets or fine emeralds due to the purity and depth of color. Just as chromium inhibits the growth of tsavorite, it does the same to chrome tourmaline, so stones over 1ct are rare, and over 2 cts are scarce, especially considering that larger stones can get overly dark. We often like to show clients chrome tourmaline and tsavorite side by side, because in the finest qualities chrome tourmaline can rival tsavorite at a lower price point. The above chrome tourmalines weigh between .69 and 1.60cts and were very difficult to photograph! The two most common varieties of tourmaline (in terms of mass of the earth’s crust) are schorl and dravite which occur in shades of brown, gold, grey and black. Even though these are the most common tourmaline varieties they are some of the rarest to find in gem quality. In the case of schorl the crystals grow quite large but are usually filled with fractures and flaws, so there is little usable material left. When the material is fine the stones are a deep black with a bright luster, so they are cut in cabochon to resemble onyx. We often see antique mourning jewelry using this as a center stone. Dravite is also typically opaque and occurs in browns, golds and other earth tones. When the crystal is gem quality the material can be faceted and it is quite pretty. Dravite often displays a distinct dichroism, showing a golden brown in one direction and a greenish or reddish brown in another. We refer to these gems as “autumn” tourmaline because they are perfectly suited to the fall season, and look very similar to gem quality Andalusite. The above two dravites are over 5cts in size and are shown against a background of a black Schorl tourmaline crystal. Tourmaline comes in so many colors and varieties that there is simply no way we can speak about all of them in one section of our website. 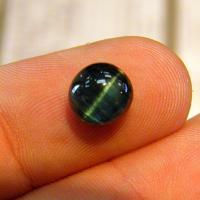 Besides the above mentioned stones, we have carried: neon yellow stones from Mali, golden orange “sunset tourmalines” from East Africa, very dark red/green color change stones from Brazil, colorless tourmaline (AKA achroite), multicolored and banded liddicoatite, and cat’s eye tourmalines in many colors and sizes.